If you are looking for the beauty of the Mexican Riviera without the hustle and bustle of Puerto Vallarta or Acapulco, this is the place for you. 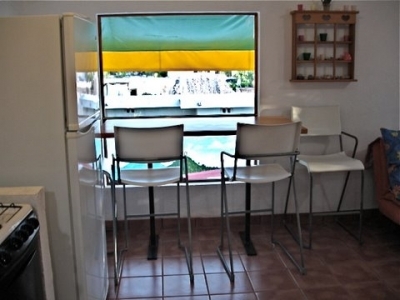 Located 7 miles from the quaint fishing village of San Blas, this one bedroom apartment has everything you need to make your vacation one you'll always remember. Prepare meals in our spacious kitchen afterward you can enjoy them in our dining room or even better our beautiful patio, overlooking the Pacific Ocean. Afterward, you can access the beach through our back gate or climb onto our sun roof for the ultimate sunbathing experience. The view is unbeatable! To complete this experience there is a large hot tub available for your enjoyment on the grounds. The apartment sleeps 5 people. It has a queen bed in the bedroom and a sofa bed and a twin in the living room. It offers wireless internet as well as private and secure parking inside the walls of the compound. A 50% deposit is necessary to hold a reservation.